He was inspired by his older brothers Bala de Plata and Angel Mensajero to train to become a professional wrestler. He was trained at Arena Nacionalista by Caudillo I, Angel Diablo and Killer Dog. Before him there was another wrestler from Tijuana under the name of Luminoso, that wrestler passed his name to him. His professional debut was in a singles match against Despiadado in Arena Nacionalista. He had earned success individually and alongside Los Hego Boys. This trio represented Mexicali against top opponents of other areas of Mexico. They became the first Mexicali Trios Champions. His individual accolades include the Americas Championship by defeating Furia Roja. In luchas de apuestas he has wagered his mask six times having worthy victories against Pzaiko, Despiadado and Gigante Blanco (Tijuana). He joined with Maverick, Last Warrior to form the Skulls and Bones. They wrestled in promotions in southern California and Mexicali. 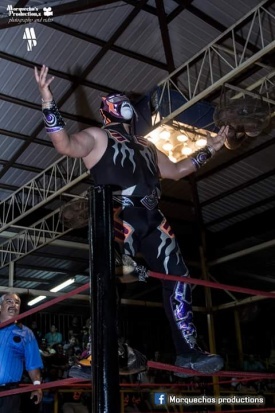 In 2015 Luminoso left behind his character and took the mantle and mask of his brother as Black Abyss USA. He eventually changed to Black Abyss Jr. Among his accomplishments as Black Abyss Jr. includes becoming the first VWE Heavyweight Champion. Los Hego Boys: Iron Boy, Luminoso & Genio Del Aire (1st versión), Luminoso, Iron Boy & Skalibur (2nd version). This page was last edited on 18 March 2019, at 21:27.